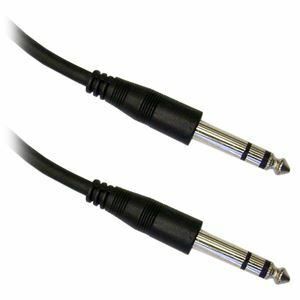 Quick overview Use this 6 foot 1/4 inch patch cable to connect stereo devices to the amplifier, such as other amplifiers, mixer boards and pre-amps. Sound Engineers setting up a studio or concert venue often use longer cables (from 10 to 20 feet) between their mixers and amplifiers on stage, and then use shorter patch cords (from a few inches to one or two feet long) to connect other devices closer to the main mixer board. This cable features a braided shield for EMI rejection and durable, molded PVC connectors to ensure a lifetime of usage.